By the end of the 2000s, DreamWorks had exhausted the pop-culture pit of puns and gags. Madagascar, Shark Tale, and their enduring golden goose the Shrek franchise saw them as one-note. The company needed a change. Kung-Fu Panda looked to be offering something of its ilk, but clearly, something more needed to be done. A risk. 2010s first How to Train Your Dragon appeared, and it critics and audiences alike that DreamWorks could produce something more. Celebrity voices weren’t used because Mum and Dad would recognise the talent, but because it fitted the character. The first film ended on a very mature message, in that actions have consequences! For the following 9 year’s we will see the characters mature, grow, and adapt to the changing times. How to Train Your Dragon: The Hidden World is the poignant and beautiful ending chapter to one of DreamWorks’ most enduring trilogies. Our protagonists are no longer children; they’re teenagers, even burgeoning into young adults. 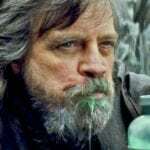 Their traits are firmly established, their charming goofiness is a reminder that they’re still kids at hear, yet the minutiae of pubescent bodily hair are showing that times have changed. 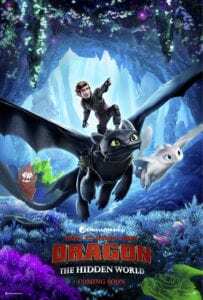 Moreover, with Hiccup now the chief of Berk (Jay Barchuel) along with his partner Astrid (America Ferrara), this film informs the audience that these characters have grown up along with you. Their prevailing idealism of a harmonious society of dragons and humans coexisting is working, though without its minor faults. Dragons are huge, clumsy, and make cause a lot of collateral damage. With two films already exploring such themes, surely a third retreat would be tiresome; even a wee bit trite. Introducing the dragon hunter Grimmel (F. Murray Abraham) who’s a fitting villain for a film signifying change. A personal vendetta against the Fury dragon, he prides himself on his intelligence, his thrill of the hunt, and his determination to hunt and kill dragons. Where previous incarnations of anti-dragon humans came from a place of ignorance, Grimmel comes from a place of hatred and prejudice. This isn’t me inferring; Hiccup says “this is the sign of the times. Our enemies are becoming smarter, more determined”. Ignorance manifest as determinism. Is this a commentary on our divided times? Perhaps that’s a discussion for scholars, but it’s a new spin on the same dragons and humans coexisting theme that drives all prior films. It’s important to note that this film does offer plenty much in the way of lighthearted fun. The twins Tuffnut and Ruffnut (Justin Rupple and Kristen Wiig, respectively) are still misguided goofballs, Snotlout’s (Jonah Hill) infatuation for Hiccup’s mum Valka (Cate Blanchett) is awkwardly funny, and the rest of the young gang bring much bereft. The discovery of the white, female Fury, dubbed Light Fury Astrid provides much for Toothless to work with. Smitten from first sight, Toothless does everything he can to impress the aloof Light Fury. Where other animated features give all animals the personality of a dog, here they include bird-display mating rituals. Morph this trait with a clueless Dragon who has never encountered a female Fury makes for some interesting exploration of dragon behaviour, as well as provide charming moments of hilarity. Additional strength to the final chapter in the How To Train Your Dragon trilogy is the visuals. As mentioned prior, the detail of pubescent adolescence is a neat touch, but it’s also the character design in the dragons. Each dragon is carefully designed to present the best qualities of that character. Regardless of size, audiences will look at any dragon in the background and see something unique. What unfolds throughout the rest of the film is this juggling act of the Berk citizens voyage to discover the Hidden World, which is important in more ways than one, the three-way relationship between Light Fury, Hiccup, and Toothless, the cat-and-mouse game with the unrelenting Grimmel, and conveying emotional resonance of maturity. All these plot threads, while nicely balanced, act as various anchors for our characters to mature. At the heart of this film is the notion of growing up, of embracing change, for better or for worse, and having to adapt to it. Ideals will always be challenged, and sometimes it’s okay to amend them for the better of others. How to Train Your Dragon: The Hidden World retains its visual splendour, it’s creative character design of these dragons, and unafraid to push the film to its rightful conclusion. A seamless sequel to its predecessor, this is a beautiful, emotional, and fitting finale to DreamWorks finest film series.